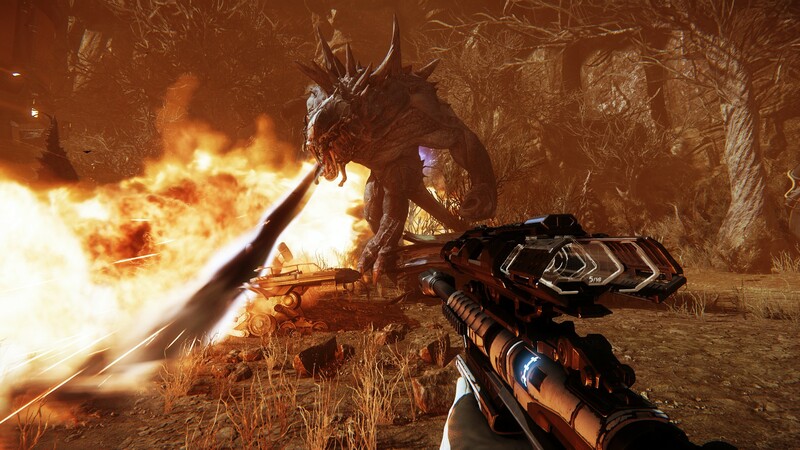 It’s fair to say that Evolve doesn’t put its best foot forward. 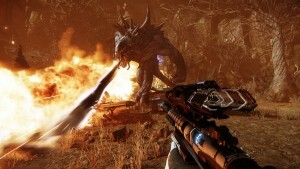 Thrust into a tutorial on the game’s mascot-like Goliath monster, the game leads players on an exhaustively point by point exposition of the game’s base mechanics as its titular antagonist. Honestly though, with its decidedly flat visuals, progression meters and reined in spectacle, it all seems about about as far from the bombastic hype machine you can possibly get. Look past its somewhat clumsy beginnings though and Evolve, as its namesake suggests, manages to grow into something quite special and certainly represents a real counterpoint to the military-themed, goon-shooters of the day. In case 2K’s Herculean promotional effort for the game hasn’t made it clear enough, Evolve is an adversarial 4 on 1 shooter and as it turns out, it happens to be a bloody good one too. The premise is simple enough; four very different, class-based hunters must take out one, hugely powerful monster who can upgrade itself and diversify its abilities through three stages of DNA-altering evolution. Goliath’s flame breath ability is great for inflicting damage over a wide area. On paper, it would seem like the sort of scenario that could outstay its welcome quickly with the appeal of the game’s seemingly forced 4 on 1 scraps dulling over time, yet such a notion couldn’t be further from the truth. Starting with the hunters, each of the four classes posses very different characteristics and roles which lend them to particular types and styles of play. Broadly speaking, the assault class is the chief damage dealer, support can deploy shielding and invisibility to other team members, the trapper possesses abilities to track, contain and limit the movement of the monster while the medic pretty much does what it says on the tin; namely healing folks if they get smacked about too much. Introducing further wrinkles to the hunter quartet are the two additional characters that can be unlocked in each class. Although each character boasts the same core abilities and skills as the class they belong to, there is enough variance in the equipment that they wield that each of them feels and plays really quite differently from the first character available. Taking the assault class as an example, the default character for that vocation, Makarov, possesses a plasma cannon for mid-range damage dealing and an assault rifle to inflict pain at longer range all the while packing proximity mines that deal huge amounts of damage if anything stumbles into their range. The next character in the assault class meanwhile, Hyde, uses a flamethrower and mini-gun for high damage at various ranges but instead of mines, possess toxic grenades that can flush monsters out of their hiding spots long enough for them to be engaged. With additional characters lending such variances to the other classes, mastery of Evolve’s hunter quartet soon becomes a longer and more rewarding affair than might immediately be apparent upon first play. Speaking of mastery, the monster itself also proves to be a deep well of learning with the player able to pile three ability points into four very different skills that can be increased each time the creature evolves. Such abilities stand in addition to the monster’s default gifts that include terrifying melee strength, the ability to jump great distances and a penchant for soaking up gargantuan amounts of damage before finally keeling over. Like its human opposition, players are able to unlock variances of the creature through skill point based progression, with the terrifying Kraken able to levitate, teleport and summon ruinous lightning storms. Sure enough though, while the unlocking of abilities and characters might seem irksome to those who have grown disillusioned with the saturation of such mechanics in contemporary multiplayer FPS titles, for others, it serves a decent incentive for both longer term play and mastery of their class. The further the monster evolves, the harder it is to kill. Don’t let it get to level 3! When it comes to a group of five players splitting the roles of hunter and monster alike, Evolve allows folks to specify a priority list so that a preferential order can be set. While this makes focusing on a singular role pretty tricky (simply because it wouldn’t be fair for the same person to fill the same role constantly), it does let players get stuck into a variety of playstyles that they might not have normally exposed themselves to. Taking down the monster is a task that requires both strategy and knowledge of how each of the four classes work in tandem. Additionally, it also demands that players are familiar with Evolve’s tracking system. The monster you see, leaves footprints in the dirt that can be tracked and can also disturb the local wildlife with a distance-plotted icon appearing on the UI illustrating where the monster’s last known location was. Adding further depth to the tracking system is Daisy, the alien-dog hybrid that the trapper class commands. Daisy isn’t just capable of sniffing out the monster; she can also pursue it aggressively, climbing up walls, leaping over obstacles and then attacking the beast when she finally finds it. Her uses don’t just end there either, the AI-controlled pooch can also revive fallen hunters too, making her feel like a fully-fledged fifth hunter rather than just a tacked on novelty. Of course, to keep things balanced, the monster can leverage the various aspects of Evolve’s tracking system as well. Aside from a neat smelling system that allows the hulking monstrosity to sniff out anything in any direction for 40 or so meters, the monster can also enter a stealth mode where his feet no longer cause tracks for the hunters to track him by. The monster can also leverage the disturbance of local wildlife in reverse too, deliberately causing the birds to scatter to lead the hunters away or into a trap. Clearly then, to say that there is substantial scope for tactical and strategical creativity in Evolve, would be quite the understatement indeed. It’s not just the monster and hunters who are involved in the struggle against one another either, the environment is a key component in the conflict too. Besides the smaller wildlife that the monster can feed on to gain armour and then eventually evolve to gain additional powers, bigger creatures can throw a real spanner into the works and like the tracking system, can be used smartly if the player is aware of how to use them. Daisy, the alien sniffer dog from Hell, is truly a great ally indeed for the hunters. From the swiftly moving reavers to the swamp-dwelling tyrants that can snap up and kill a hunter in seconds, the monster can avoid open conflict with these sub-predators, or, use them in their fight against the hunters, proving that there are fewer things more satisfying the punting a hunter into a tyrant-inhabited swamp, watching with glee as they get chomped. While victory as team hunter demands teamwork and coordination, success as a monster revolves around the ability of the player to keep the beast away from the hunters whilst it goes off on a buffet of the local wildlife in a bid to evolve itself. When a level 3 evolution is reached, the monster becomes a much more stronger foe and one who is able to confront the quartet of hunters with ease. Before then however, the game can sometimes turn into a game of hide and seek when playing with more experienced players as they refuse to engage on the lower levels of evolution. Still, the feeling of satisfaction and elation that follows when a stage 3 monster is vanquished is a palpable feeling indeed and in this way, Evolve adheres to Bungie’s old adage of repeating “the best 30 seconds of gameplay”, since Evolve’s monster battles each feel like the sort of gargantuan boss battle events that you only usually get in single-player shooters. 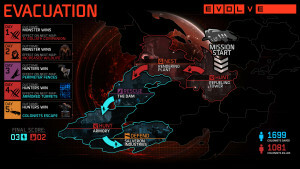 To spice up the game’s multiplayer offering, developer Turtle Rock Studios have also included a mode called ‘Evacuation’ that allows players to compete in co-op against AI controlled monsters across an on-going campaign, linked by cut-scenes and set across the 12 different maps spread across the planet Shear. As well as varying objectives such as destroying monster eggs, protecting power stations and naturally, fighting against monsters, the beauty of this mode, is that whichever side wins one battle causes effects to appear on the next. In this way, Evolve’s Evacuation mode echoes the progressional multiplayer elements from last year’s Xbox One exclusive shooter, Titanfall. 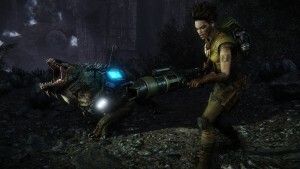 A single-player mode also manifests itself, but given how multiplayer-focused Evolve is, it should come as little surprise to discover that such solo content serves as little more than a training ground for the game’s more social modus operandi. 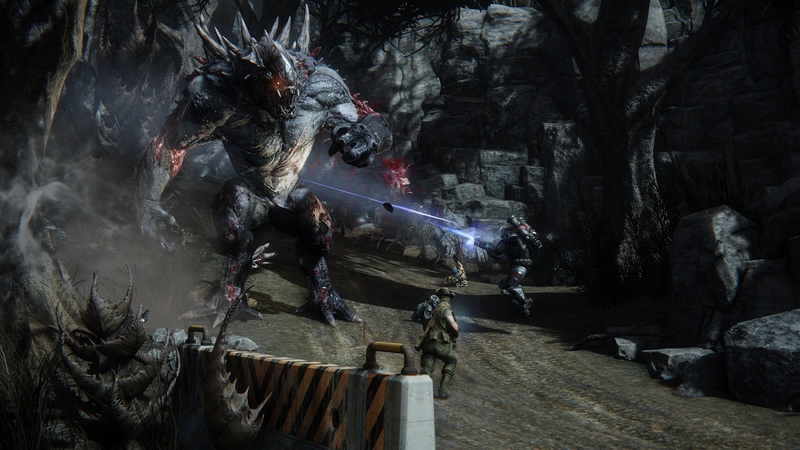 Evolve’s Evacuation mode gives the game longevity far beyond its regular skirmish modes. Evolve isn’t perfect, though. As breathtaking as the 4 on 1 battles can be, they do somewhat rely on experienced players on both sides to make them work as properly as the developer intended. Equally, the presence of progressional unlocks will no doubt raise the ire of folks who have grown tired of such industry-standard foibles. As it is though and taken on its merits as an asynchronous multiplayer shooter, Evolve duly impresses. Its seemingly shallow adversarial premise gives way to a game that is deceptively tactical and packed with opportunity for player creativity even if the progression systems and reliance on sensible players sometimes threaten to dull the affair from time to time. Evolve was developed by Turtle Rock Studios and published by 2K. This title is currently available on PlayStation 4, Xbox One, and PC. PlayStation 4 review code was kindly supplied by the publisher for the purposes of this review.